Punjab Defence Services Recruitment 2017: Good is here for all citizens of Punjab State. 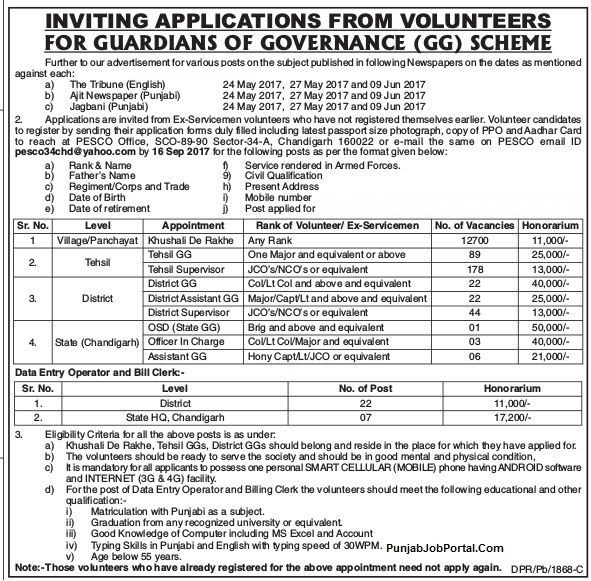 The officials of the Directorate of Defense Services Welfare, Punjab has recently issued an recruitment notification named as Punjab Defence Services Recruitment 2017 to fill 13094 Guardians Of Governance vacant posts in different department like Khushali De Rakhe, Tehsil GG, Tehsil Supervisor, District GG, District Assistant GG, District Supervisor, OSD (State GG), Officer in Charge, Assistant GG Vacancies. So candidates who satisfy the eligibility according to the official Punjab Defence Services Recruitment 2017 Notification they can apply for these posts before 16-09-2017. To complete the application submission we suggest the contenders check the details twice to avoid misconceptions. And if you are willing to check other State Govt Jobs visit our site where our sarkarirecruitment.com team members have updated all the latest recruitment notification regarding the Punjab State. You can also check the Latest Syllabus and Previous Papers pdf to download for the Punjab Defence Services Recruitment. According to the officials of the Punjab Defence Services, it is given in employment notification that the aspirants who are showing their eagerness towards the Punjab Defence Services Recruitment 2017 should have done Matriculation with a Punjabi Subject / Graduation from any recognized univeristy or institution and have Good knowledge in Computer including MS Excel and Accounts. They can also possess good typing skills in Punjabi and English with Typing speed of 30 Words per Minute are the minimum educational requirements. And applying aspirants should obey the age limit according to the rules of the Punjab Defence Services. So applicants age should not exceed 55 years. And for upper age relaxation check the official Punjab Defence Services Recruitment 2017 Notification which is given on this page. Here on this page aspirants can get the direct links to download the Punjab Defence Services Vacancies Notification. After downloading it’s you can read the official Advt to know the eligibility of the aspirant to apply for these Punjab Defence Services Recruitment for 13094 jobs. After reading its job hunter those who think that they are eligible those applicants can apply for the Punjab Defence Services Recruitment 2017 before the closing date of the application form. Aspirants who wish to do a job in this Punjab Defence Services they have ready to face a recruitment process which is conducted by the officials of the Punjab Defence Services in around Punjab State at different Centers on scheduled dates. So as per the Punjab Defence Services Recruitment 2017 notification, applicants will undergo for the Written Test and a Personal interview as part of the selection process. You have to note that candidates who got minimum cut off marks in the written test they only eligible to the other recruitment rounds. And the final decision will be made by the officials of the Punjab Defence Services. To attend the written exam you have to download the Admit Card before going to appear for the written test. With out having hall ticket you are not eligible to write the Punjab Defence Services Written exam. So for more details about the Punjab Defence Services Recruitment 2017 Notification check the below sections of this page which will be updated by our team members according to the official notification. Applicants those who got recruited by the officials only after checking their merit in the selection rounds the organization is going to offer good salary as per rules. It is mentioned in the official Punjab Defence Services Recruitment 2017 Notification that candidates Pay Scale of Rs.11,000 /- to Rs.50,000/- Per Month. And it will vary with the post to post so read the notification to get complete Post wise details about the Pay Band. Candidates who are willing to apply for Punjab Defence Services Recruitment 2017 should have done Matriculation with a Punjabi Subject / Graduation from any recognized univeristy or institution and have Good knowledge in Computer including MS Excel and Accounts. They can also possess good typing skills in Punjabi and English with Typing speed of 30 Words per Minute are the minimum educational requirements. Candidates age limit should not exceed 55 years. And for upper age relaxation check the official Punjab Defence Services Recruitment 2017 Notification which is given on this page. As per the notification, there is no application fee. But we suggest the aspirants visit the official web page of the Punjab Defence Services which is www.punjabexservicemen.org to get more details about the application fee. As per the Punjab Defence Services Recruitment 2017 notification, applicants will undergo for the Written Test and a Personal interview as a part of the selection process. You have to note that candidates who got minimum cut off marks in the written test they only eligible to the other recruitment rounds. And the final deception will be made by the officials of the Punjab Defence Services. Applicants those who got recruited by the officials only after checking their merit in the selection rounds the organization is going to offer good salary as per rules. Aspirants pay Scale of Rs.11,000 /- to Rs.50,000/- Per Month. And it will vary with the post to post so read the notification to get complete Post wise details about the Pay Band. 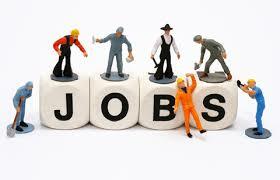 Aspirants who fulfil all the requirements may apply through Online.